I was checking up on my final project videos and was amazed at how many views it has. I just thought you might think it was cool haha. Step back, this video, that was part of Eric’s final storytelling project, has over 112,00 views. You might add up the views on all my YouTube videos, and its still less than that. As somewhat of a conclusion, I chose to use the video assignment ds106 fave moments. I made a video montage of my top 5 favorite pawn stars moments, with a mix of actual items and just funny things in the show. Although I was disappointed that I couldn’t fix the audio sync issues, this is the assignment that I spent the most time on and am most happy about. I wish I could have had good quality clips for each pick, but unfortunately youtube didn’t have the best options. That said I am still very happy with how it turned out. Dude– that really needed some beats in it!) built around the Pawn Stars show for his final story work. I had wanted to see a bit more tying together of the different pieces of media into a cohesive story (note to present students, pay attention), but still, I have to drop all of that and says woah, 112,000 views. I hope your pappy is proud Eric, I sure am. But see, what ds106 is really about is this explosion of creativity for 14 weeks. It’s not about the actual products but the process, and writing about it, and what it seeds for later potential in knowing the media creation skills and ideas. And that leads me to this incredible photo by early ds106 veteran Serena Epstein who’s design, visual, photographic, creative skills were already huge in her time as a ds106 student, and have continued to grow since then. 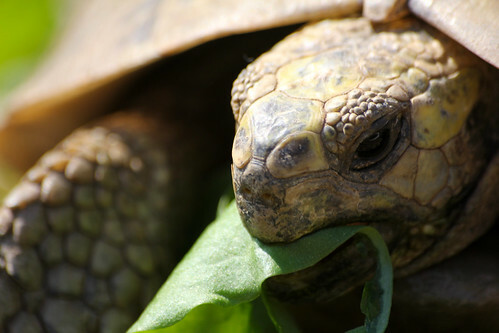 In commenting on her photo, her reply fills in the story, and how she has taken the idea of blogs as open publishing where there is a blog at the school she works that is dedicated to the plight of tortoises. ds106 is just a start for many people. It goes on and on and on. You do not get this inside a closed box like Coursera, etc. That is the falseness of their mis-appropriation of the simple word “open”, where in the xMOOC space, is only one way. In. What I’ve come up with is the fact that the biggest, coolest thing about ds106 isn’t the content it covers””in fact, the course doesn’t have a single consistent lesson plan. Instead, it offers students (and educators!) an introduction to numerous methods of creating stories using digital resources. The ways in which students learn to use those resources change depending on who is teaching the course, whether or not they’re affiliated with UMW or are open participants, and even which assignments the individual student chooses to complete. At its core, though, ds106 is just as much about conveying a particular ethos, informed by the rhetoric of innovation and open education that’s part of the larger conversation about edtech. When I say “rhetoric of innovation,” I’m referring to the line of thinking that pursuing a new way of completing a task, a new way of thinking, or a unique experience is more valuable than sticking to well-established methods, which I encountered constantly (and found incredibly compelling) as a student in ds106. The value of open resources, online communities as vital spaces for learning, the thoughtful creation of identity online, and giving students the freedom to create their own learning experiences are all integral to the ds106 experience. Each of those elements reflects the overarching ethos established by the professors who constructed and teach the course, one that touts openness, creativity and the innovative use of tech as essential components for constructing a new, more compelling and student-driven educational model. You can have your badge or certificate, I will take the ethos for 500, Alec. And the Daily Double.